Autotesting is the cheapest and one of the most entertaining forms of motorsport you can take part in. You can either compete in your standard road car or a specially adapted one. Autotesting is not a high speed event, it is more a test of memory and agility. You will normally only require first gear and reverse. 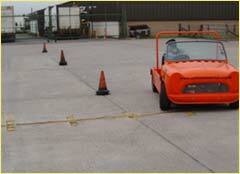 A must is a good handbrake for getting round the cones quickly. 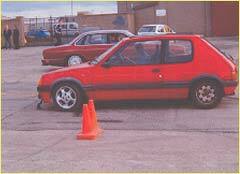 The main benefit of Autotesting is that you can start competing at fourteen years old! and the cost to enter is only £10 per event. You do not need a MSA license, as long as you are a Caithness Car Club member (and hold a driving licence) or a member of any other MSA affiliated club. Six events are planned for the 2008 season and take place at the Old Parade Ground in Wick (beside W Bremner's Garage). Events start sharp at 7:00pm, so make sure you are there in plenty of time. The 2008 dates are yet to be finalised, so please keep checking the website. You can download a copy of the courses below. The actual course used on the night is selected from a hat.